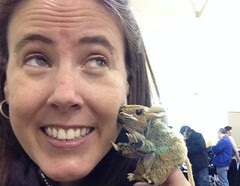 It's been several months since Algernon headed off to his next adventure. I still miss him. He'll always hold a small, dirty white space in my heart. 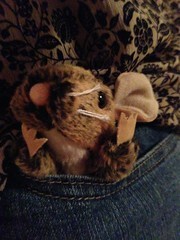 And yet, even though his absence still stings, I think I might be finally ready to start bringing a new mousy friend on adventures with me. 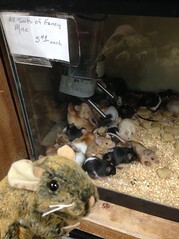 Because you all are the best, I had a large selection of rodent buddies from which to choose. I ended up drawn to a mouse that I had originally given Quinn because he wanted his own little guy like Algernon. 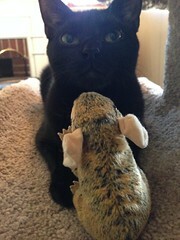 After he saw all of the friends you guys sent, he gave me the gift of the mouse I had given to him months before. He is a mouse born for adventure. I started carrying him around with me a while back. There's more to adopting a new mascot, however, than just popping him in your bag and dragging him places he doesn't want to go. You also have to name the little dude. I spent a long time trying to find the moniker that suited him best. I tried to find mouse names from literature, but none of them suited him that well. I ruminated on his name for a really long time, but there was one name that stuck with me. I decided to let him tell you what it is. Naming task taken care of, we headed out to see what we could see. 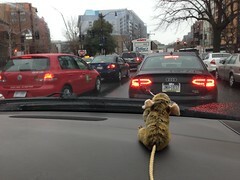 Unfortunately, most of what we saw on Chester's first trip out was traffic. He did better on a later trip to the pet store where I was buying a lot of lab blocks (aka, food) to feed my gerbils. Chester got reacquainted with some old friends. 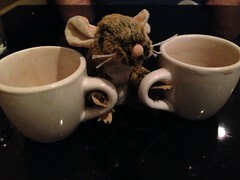 Fancy mice. All sorts of them. I've been enjoying having Chester around, but he's a little bit of an attention hog and he will go to any means necessary to get it. I will say this for him: He's a very brave mouse. I blame a lot of his bravado and wild behavior on all the caffeine he drinks. 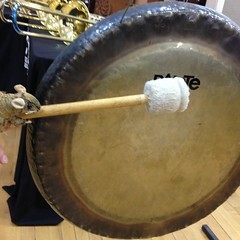 And sometimes he REALLY overdoes it. 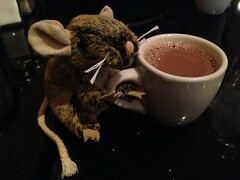 And sometimes that mouse straight up embarrasses himself. Regardless of his addictive behavior and his guzzling of hot chocolate out of coffee cups, I feel very thankful for Quinn's selfless generosity. 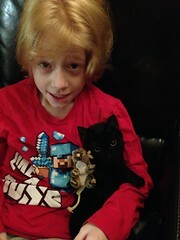 No matter what, I think this is the beginning of a beautiful friendship. I hope we have a lot of adventures together. In other news, Jack’s special hockey team, the Montgomery Cheetahs, is still soliciting donations for their big fundraiser coming up in May. Thank you so much to Jodi and the Paulsons for their donations. You can make your own donation online. So happy to meet you Chester!! Well howdy do, Chester! I can already tell that you're awesome. You picked a really cool human to hang out with, well done. Also, she has really nice teeth. Hello to Chester! 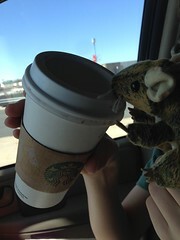 He drinks coffee like I do! Can't wait to read about his new adventures. Welcome Chester! And that Quinn is a very sweet guy. Squeak! Well, I just posted in my blog. This makes me happy :) Perfect moniker, love his style. Aww! Chester's marled coat appears well-suited to trekking around DC and elsewhere. I know! I really approve of Chester's dirt-hiding abilities! That is tiny kitten Starfire in that photo. I would suggest that the wide eyes convey alarm at her situation. Oh, I love him. He's absolutely, perfectly, just-right. 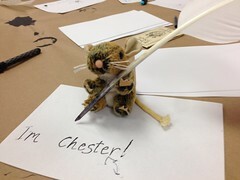 Chester is a cute little mouse! But I am so sorry that Algernon got stolen. I can definitely understand how sad it can be to lose a stuffed animal... I have had my teddybear Chumbawamba for 17 years, and if I lost him I'd be heartbroken too!